If there’s one thing we’ve learned during our series of blind tastings over the last few years, it’s this: when you remove preconceived notions and marketing hype and cut right to the chase (in this case taste), the results are often surprising. Our most recent experience, a regional bracketed March Madness style blind tasting of 48 Massachusetts IPAs, was no exception. If you swear by beer ratings, the outcome of our blind tasting tournament may surprise you. But make no mistake, we’re not trying to tell anyone what beer they should drink, or even what they should think about the most popular brands. Our intention is to get people to think for themselves, trust their own palates, and rely on their own experiences when it comes to forming judgements. What we’ve discovered along the way is that there are far more beers and breweries in Massachusetts that deserve the high praise usually reserved for just a few. If you want proof of that, look no further than the 8 beers which advanced to our championship round last night at the Society of Master Beercierge in Belmont, half of which came from breweries who opened less than a year ago. The other four have garnered their share of accolades (though not necessarily in this style), but don’t always top the popular ratings platforms. Based on our results, they may be worth more consideration. One final word before moving on to the results. The field of entrants for our tournament was comprised of 48 IPAs of various styles (though mostly hazy and juicy) from 48 different Massachusetts breweries. We used what was available and freshest at the time of each regional tasting event, and what each store venue was able to acquire. We also had to take into account our finite ability to travel around the state for non-distributed brewery exclusives. Once we had our list of offerings, we seeded them based on existing ratings (primarily Untappd) to prevent any bias on our part. Admittedly, seeding them by ratings was also an interesting opportunity to see how those ratings compared to our blind tasting results. The Northeast Regional tasting was held at Total Wine and More in Burlington and featured a dozen offerings from Metro Boston and points north. The region’s ultimate winner was an 8% NE style DIPA from the legendary Cambridge Brewing Company called The Fog That Surrounds. 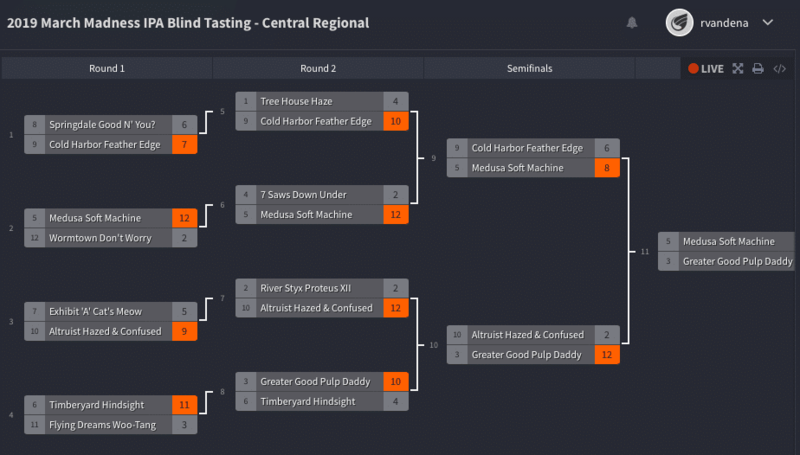 It made its way through the bracket by edging out Mystic Brewery’s DDH Saturation, top rated Double Hop Hop from Aeronaut, Four Seam from Idle Hands, and regional finalist Judah from the newish Essex County Brewing in Peabody. Click to expand the image above and get a closer look at how the North bracket played out. Scores represent the number of tasters who chose that beer. 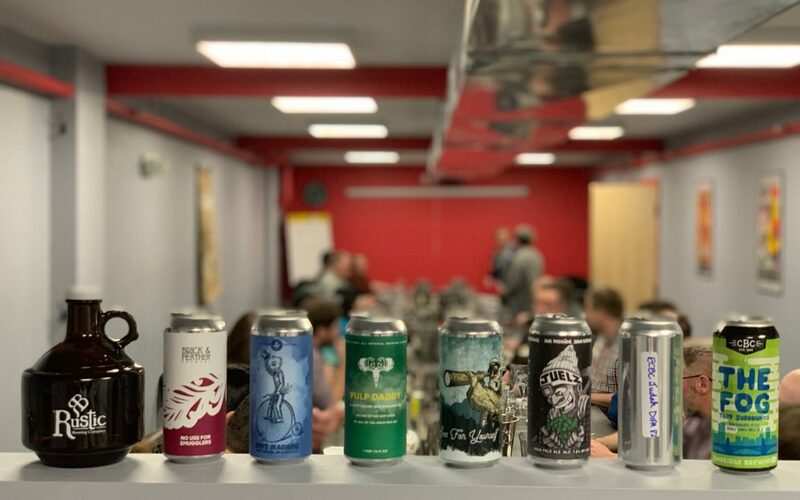 The Southeast Regional tasting, held at Yankee Spirits in Norwood, was dominated by relative newcomer Canned Heat Craft Beer Co., who debuted its Fall River micro brewery and taproom this past October with the ideal of making exceptional beer that goes beyond perceived boundaries. Juelz, their 7.9% NE style DIPA, lived up to those expectations by advancing through the bracket and defeating Invisible Airwaves from Stellwagen, Flyaway from Shovel Town Brewery, and Sea For Yourself from Weymouth’s Vitamin Sea Brewing. Click to expand the image above and get a closer look at how the South bracket played out. Scores represent the number of tasters who chose that beer. The Central Regional tasting went off at Julio’s Liquors in Westborough, where Worcester’s Greater Good Imperial Brewing emerged victorious behind its 8% NE style Imperial IPA called PULP Daddy (an extension of their popular PULP offering). 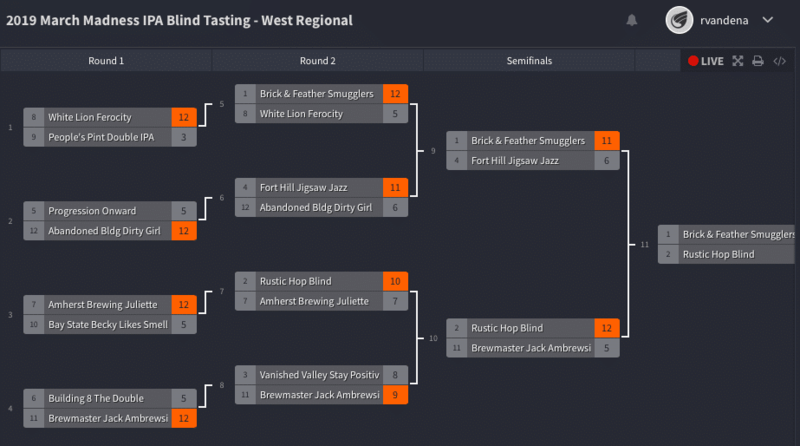 Its advancement through the bracket included convincing victories over Timberyard’s Hindsight, Hazed & Confused from Altruist Brewing, and Medusa’s Soft Machine. Click to expand the image above and get a closer look at how the Central bracket played out. Scores represent the number of tasters who chose that beer. The West Regional tasting was hosted by the Table & Vine flagship store in West Springfield, where Brick & Feather’s No Use For Smugglers, an 8% American DIPA, made its way through a competitive field and claimed the bracket with wins against Ferocity from White Lion, Jigsaw Jazz from Fort Hill, and the defending champion Hop Blind from last year’s cinderella story Rustic Brewing. With each the regional brackets decided, it was on to the Final Four. Click to expand the image above and get a closer look at how the West bracket played out. Scores represent the number of tasters who chose that beer. For our championship event we called on Craft Beer Cellar’s mother ship in Belmont, now also home to The Master Society of Beercierge next door, to watch the Elite 8 battle it out for this year’s Massachusetts Most Tasty IPA Championship belt. 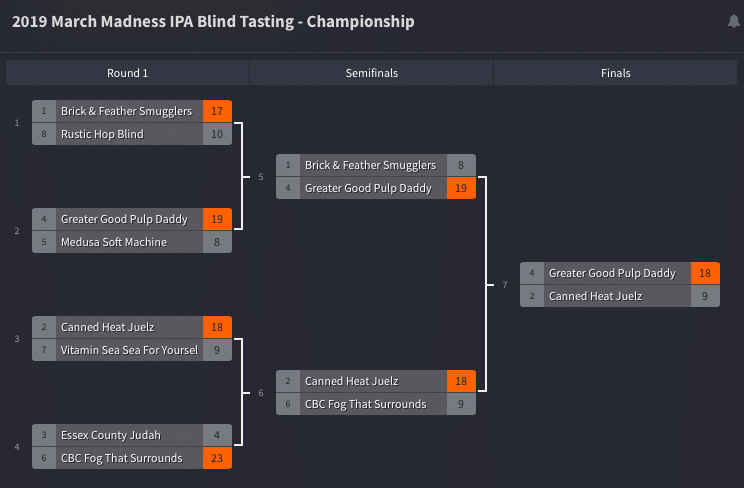 In the North versus South semifinal, Canned Heat’s Juelz won convincingly. Greater Good’s PULP Daddy did likewise in the West versus Central semifinal, and then cruised to ultimate victory to claim the Mass. Brew Bros. 2019 Massachusetts Most Tasty IPA title. Described as “nectar of the hop gods” its hazy appearance, nebulous mouthfeel, and predominantly citrusy aroma and taste made it an overwhelming favorite. Click to expand the image above and get a closer look at how the championship bracket played out. Scores represent the number of tasters who chose that beer. 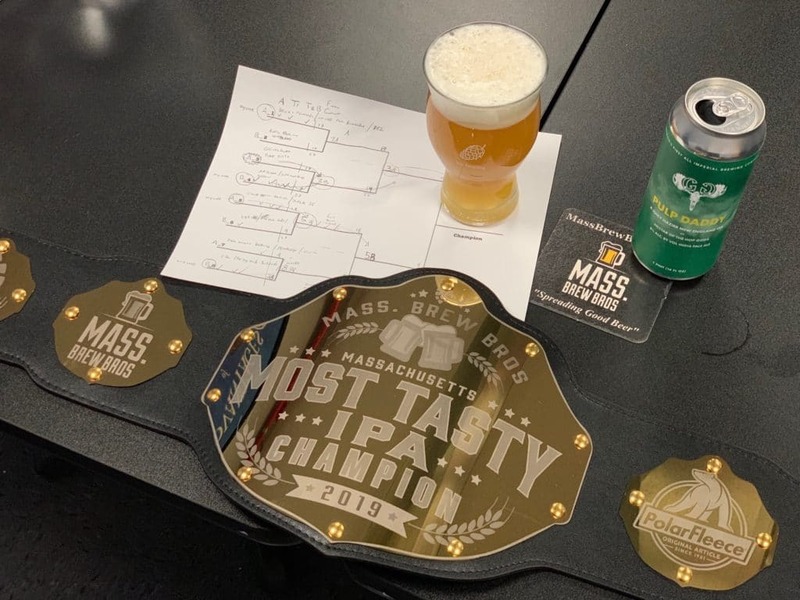 PULP Daddy Imperial IPA from Greater Good Imperial Brewing was crowned the 2019 Massachusetts Most Tasty IPA Champion. In closing, we want to be clear that we don’t take ourselves too seriously. 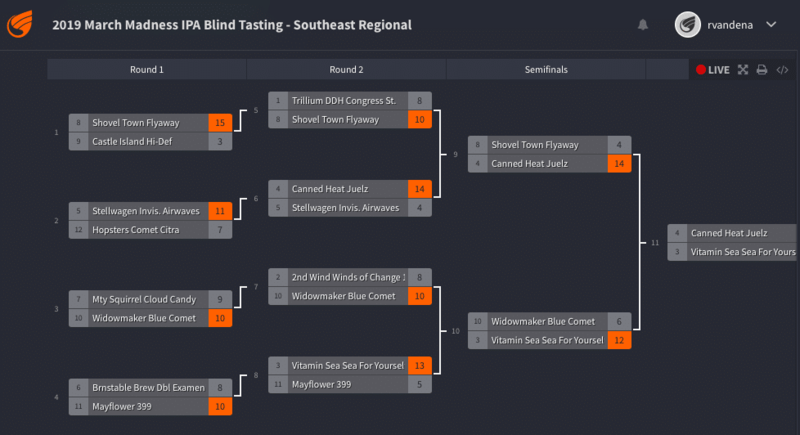 While we put great effort into our March Madness style blind tasting tournament this year (and we hope to expand it to a full field of 64 next year) the overarching idea was to have fun. That’s what blind tastings are all about: finding out which beers, minus any hype or presumption, translate into enjoyable drinking experiences. Our contention is that there are far more of them out there than you’re led to believe. Instead of relying on beer ratings sites or apps, go do your own blind tasting, of whatever style you like, and trust your palate to reveal what your favorite beers really are. Dorchester Brewing Company, Wicked Twisted Pretzels and Mass Brew Bros are excited to announce their collaboration limited edition beer and event to celebrate National Pretzel Day, taking place on Friday, April 26th which will include a beer release, Revelry Food Truck and live music Muhammad Seven & the Spring from 7-9:30pm!! Click above for more details or to RSVP. Much fun!! Thanks for hosting! This was such a fun a and well constructed event across the various locations. Looking forward to participating in more in the future! 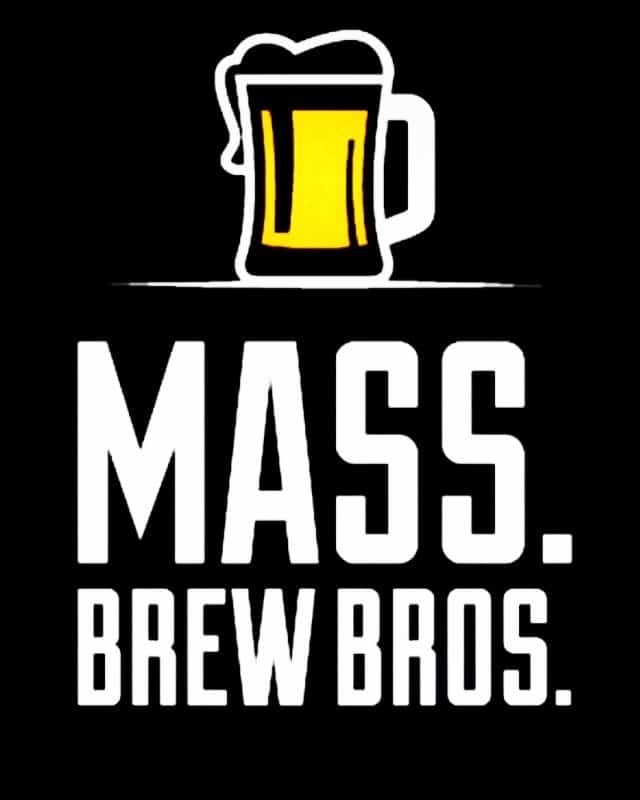 Thank you Mass Brew Bros for understanding the true importance of blind assessments and maintaining strong integrity to that regard in the March madness contest. This form of contest and competition drives craft beer quality to grow to the highest form in Massachusetts. Massachusetts has a lot to be proud of with its craft brewery offerings! Let’s Rock it Massachusetts Brew Crafters! No Tree House,Trillium or Exhibit A? Please. so waiting in line for an hour means the beer is over rated? How about the beer is awesome so people drive from 100’s of miles away to purchase it. Dan, please don’t wait in line for the beer, less people in front of me. Keep drinking that Miller Lite. Read the blog and you’ll see that all three of those breweries were included: Tree House and Exhibit ‘A’ in the Central bracket, and Trillium in the Southeast. There were some excellent beers that didn’t go far. My guess is too many new school juice bomb lovers skewed the results. There were more than 100 tasters, from a variety of backgrounds and with an array of preferences and opinions. Funny what happens when you remove the marketing hype and just drink the beer without knowing how made it. It’s often surprising. What it says to us, is that there are far more than just a handful of breweries making some really tasty IPAs these days.